This morning we ran the Super Jock N Jill Half Marathon HERE in BEAUTIFUL Woodinville, WA. Due to not knowing my travel schedule I knew this would be a last minute decision, but I really wanted to hang with Amanda HERE even if it was just for the car ride and lunch..
WANT TO KNOW A SECRET? I love racing more for the before and after than the during... Hanging with the girls is such a BLAST!!.. Amanda's buddy Jess was running the 4 miler, Amanda was torn having just run an 18 miler but I had my heart stuck on the Half. I was not feeling Half PR fit or focused so I emailed Jill HERE to see if she wanted to come along. Amanda, Jill and I made plans on Sunday and signed up "Amanda Style" on race day. Jill and I wanted to match, so we tested our You go Girl team outfits... it was a bit Chilly and drizzly rain, so long sleeves were needed. So funny it looks like Jill is Glowing.. We relaxed a bit and chatted, then it was time to get to the start.. I love love this picture!! So funny because this was Jill and my FIRST RUN together.. Not sure why?? 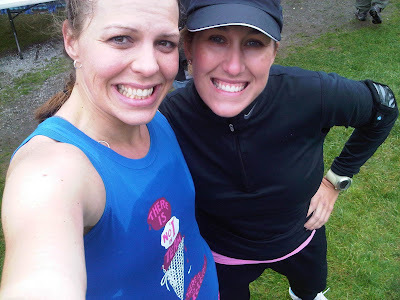 We have known each other since we were little girls, reconnecting the past few years, now running/blogging buddies. LOVE IT! I was pumped to test out my pacing/coaching, I expect a full review from Jill. Looking forward. One bummer was there was no start mat, so we lost 10-15 seconds crossing the start..
Sooo many people wore the Super Jock N Jill Brooks T-shirts. It reminded me of highlighters, every fourth person was in the shirt. SAFETY for sure! I did not buy the shirt, but I know a lot of people were very happy..
We set out and settled into a comfortable pace. When I run with people I like to run a half a set behind, so that is what I did with Jill. If she needed me to speed ahead to push her I would have. I am new to coaching, pacing, etc... what I do know is that I LOVE IT!! What a wonderful and positive experience.. I mean look at this girl!! 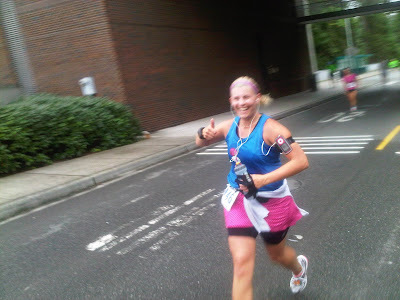 She had a strong stride, never hit the wall and was so positive the whole time. I reminded Jill to relax, drink, and focus on her form. It will be great to get coaching training in October!! 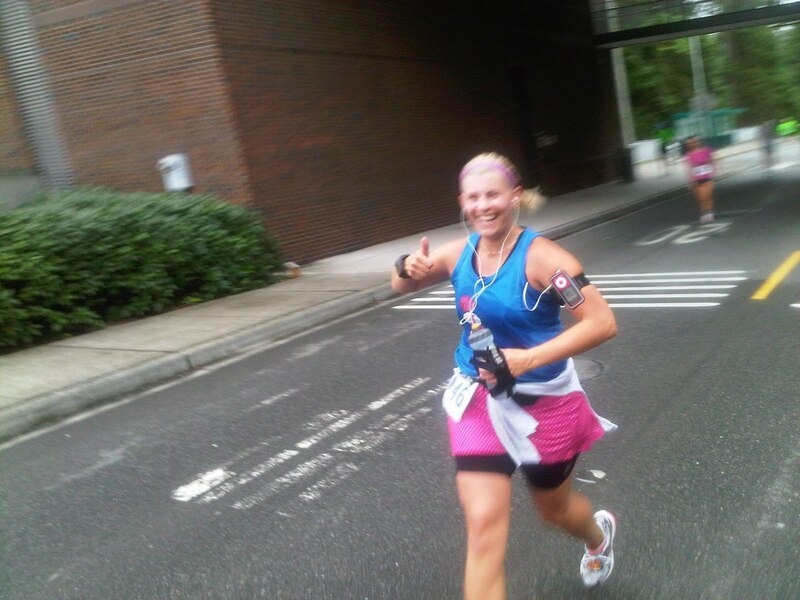 The front runner lady was wearing ELITE gear ie. sports bra and spankies mind you it was cold and rainy.. WOW!! Mile 8.5 I saw a little baby eating a banana followed by a little girl with a banana less than 6 steps away, I looked around to avoid any unfortunate slipping on peels. 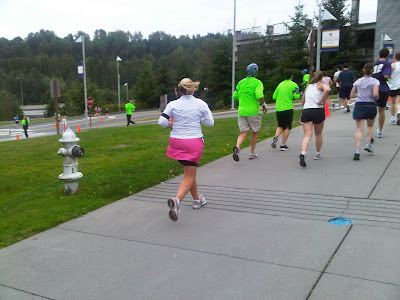 I ran ahead to take pictures, guess I should have sprinted further because running backwards at 9:10ish pace is TOUGH!! Oh well, blurry is still fun. I got out my phone around mile 9, texted Muscle Man and Amanda. Texting and running is not easy. At that point the PR for Jilly was in the bag, we just had to take it home. I felt GREAT, this pace is comfortable for me. Jill turned on her music and we took on the last 5K by picking off people left and right. We spotted Shelby, caught up to her, I could tell she was hurting, her hip was not feeling good. I tried to help her along, but running with an injury is never good. 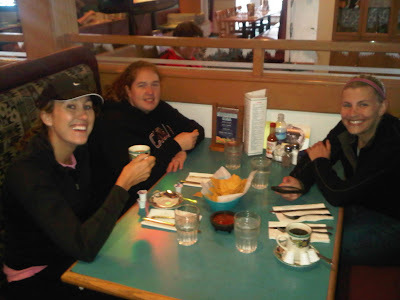 We cruised through the water stop because we had our handhelds, and we lost Shelby as she slowed for a sip. I can't emphasize how GREAT this course is. It is flat, winds round so you have new things to look at, follows the river, and is very well organized with signage and volunteers. The last 5K was a blur, we sped up I think I still need to plug in. The ONLY bummer was the Half Marathon Walkers who walked 3-4 in a line blocking the entire way. It was like a bad version of Red Rover... REALLY PEOPLE? I love that they are doing it, but the fact that they are registered means that they are AWARE that runners are using the same pavement, share!! Coming to the last stretch Jill saw a friend, smiled and yelled hello... Don't think she realized how much energy that took, not two breath later she said "I am going to die" or something like that.. I said "No you are not, the Finish is around the corner." We sped to the line DONE!!! 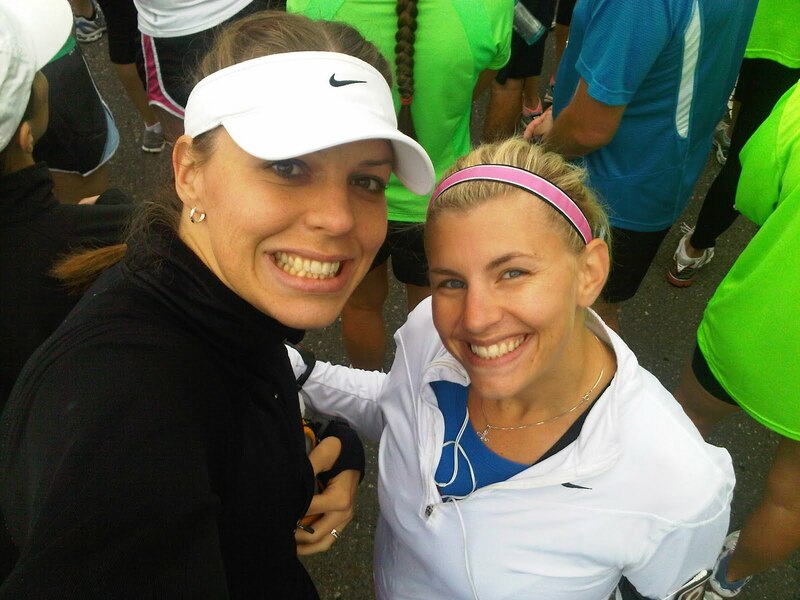 Jess and Amanda were Patiently waiting and freezing, they had run the 4 miler. 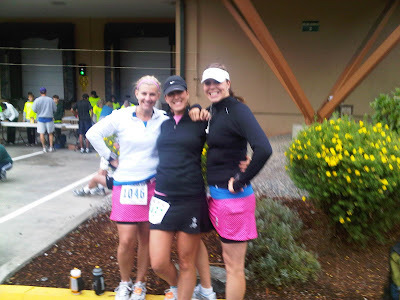 Not to get sappy but this will be one of our last WA runs for a while with Amanda :( Booooo!! Lucky me, local Bloggies are going to have lunch tomorrow to make plans for You Go Girl this month and our Bloggy guests coming from out of town. We changed a little and headed to Mexican just down the road. Mexican and coffee, YUMMY!! Thanks girls for a GREAT morning. ****Will plug in and get the breakdown to go with my Lessons Learned post. Sounds like a really great and fun race!! Way to go!! congrats mel!! i love how happy jill looks :) (and you too of course). sounds like you guys had a really great race! and you are so right, i love courses that keep you perked up, winding around, new things/change of scenery/turns. 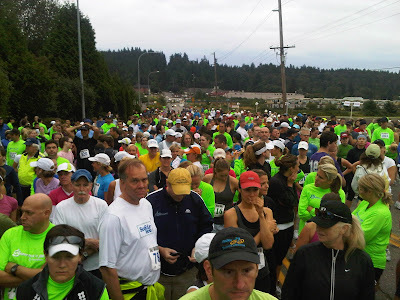 the half i ran this weekend has miles 5-10 "scenic" but NO PEOPLE, trees all around, monotonous hills ONE ROAD ahhhhhhh! i was literally by myself for a lot of the time. ugh! hahaha. 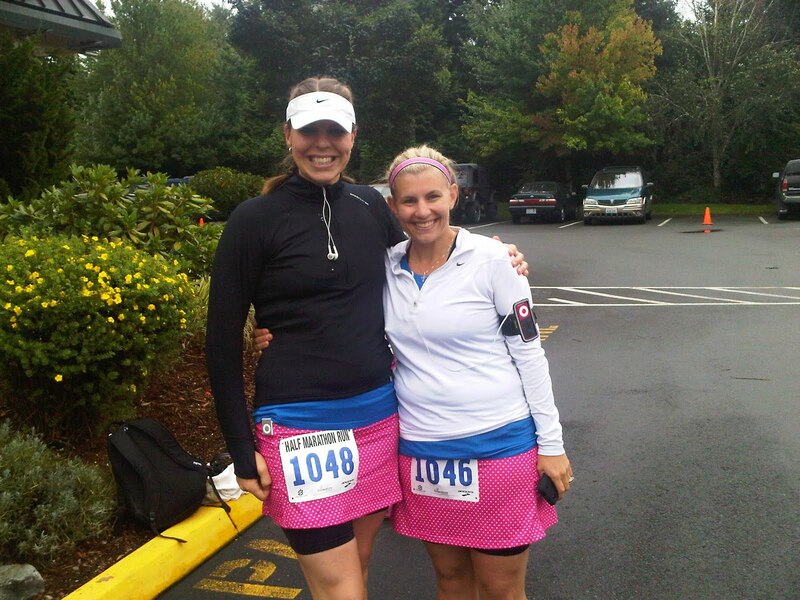 Sounds like you did an AWESOME job coaching/pacing Jill. You guys are super cute and I'm sure it was a blast. I miss my Seattle girls!!!!!! wow, looks like so much fun!! wish i lived near you ladies! Mel, not sure if you got my email but can you please email me the link to the 1000 mile club spreadsheet? Ryand and I can't seemt o fine it! thanks! Whoo hoo! Nice run! 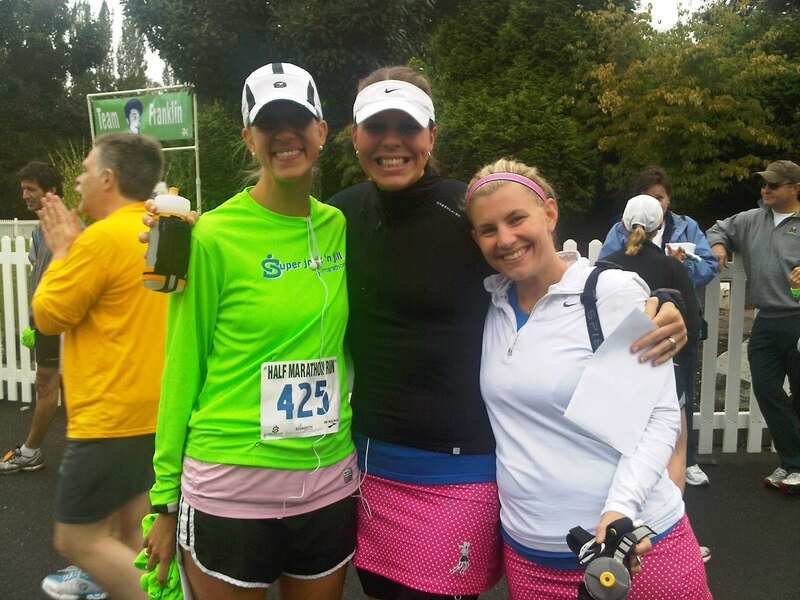 Congrats on pacing Jill to a great time! I wish I was running with you! Seems like you did an awesome job Coach! Plus it looks like super fun to boot! Stacie and I will be in Woodinville next weekend for our tri and hope our course is just as nice! Sounds like a blast! I can't wait run with you and PR in 19 days!! how fun! Congrats to Jill and her 'pacer'! :) you guys are awesome!! SO fun, congrats to Jill! I LOVE the ice cream T-shirts!!!! So cute. Can't believe you'll haven't run together before. That's crazyy!!!! Great job COACH...You are AWEOME and now I just might need to stick by your side at You Go Girl! 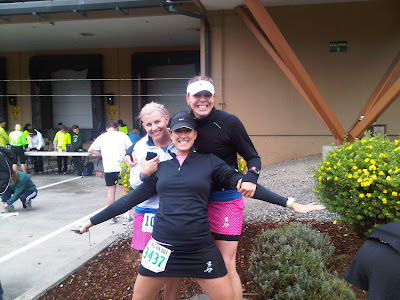 It's so true about the fun before and after...I have thought it and it's one of the MAJOR motivators to running races. The fun friends and the excitment that the race brings. 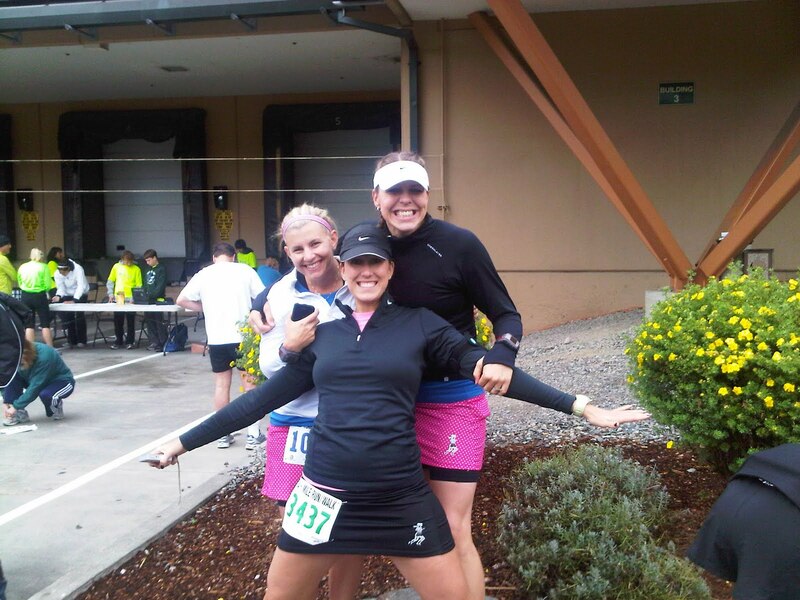 Running with friends is so much fun. I'd be hyperventilating at that pace! 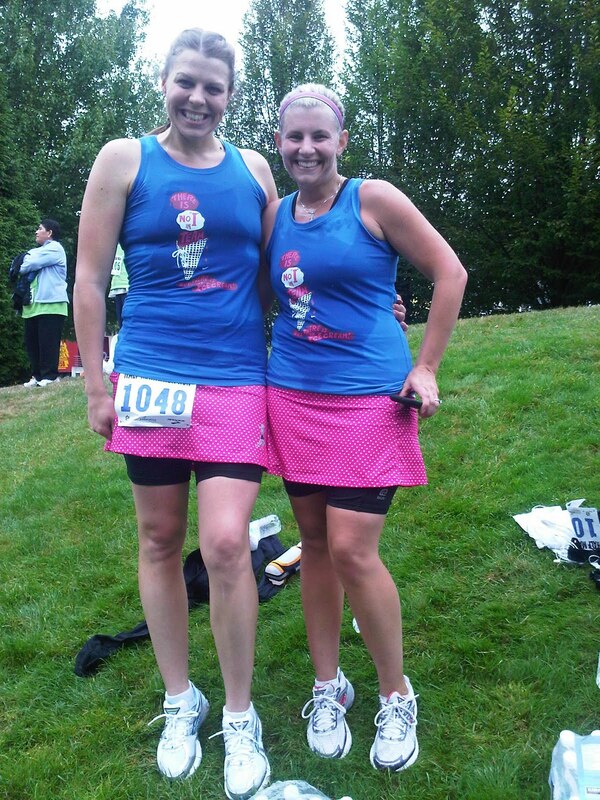 Congrats on the race and love the outfits (I've been eyeballing that Nike ice cream shirt for awhile). Maybe I will throw a Going Away Race or something....one last ditch effort. I am so glad you and Jill came along!! Always ALWAYS a great time with you!! wow, Mel, i could sure use you as a pacer!! sounds like an awesome race! btw, this weekend I ordered the black version of that skirt. i like the dots. and the red version looks cute on you ladies! You two are adorable in your matching outfits. Great job on helping a friend get a PR. Kudo's to you!!!! Now I see that the skirts are the pink with black dot's - that first pic makes them look neon pink. Love it! I'm so glad you decided to run and had such a great time! 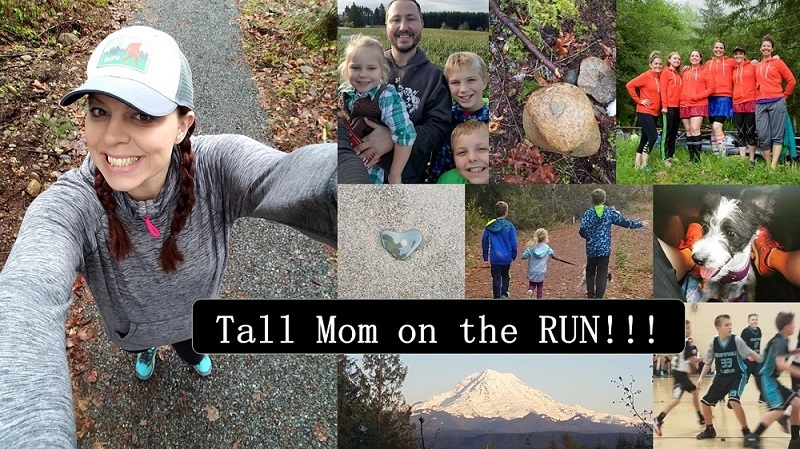 The pics look fantastic and your recap makes me want to run this race next year! Sounds like an AWESOME time! Way to go! Great race! Sounds like you did a great job with the pacing. I'm pacing someone for the first time in less than two weeks. I'm a bit nervous LOL. Hopefully it will go well. Great job on the pacing. 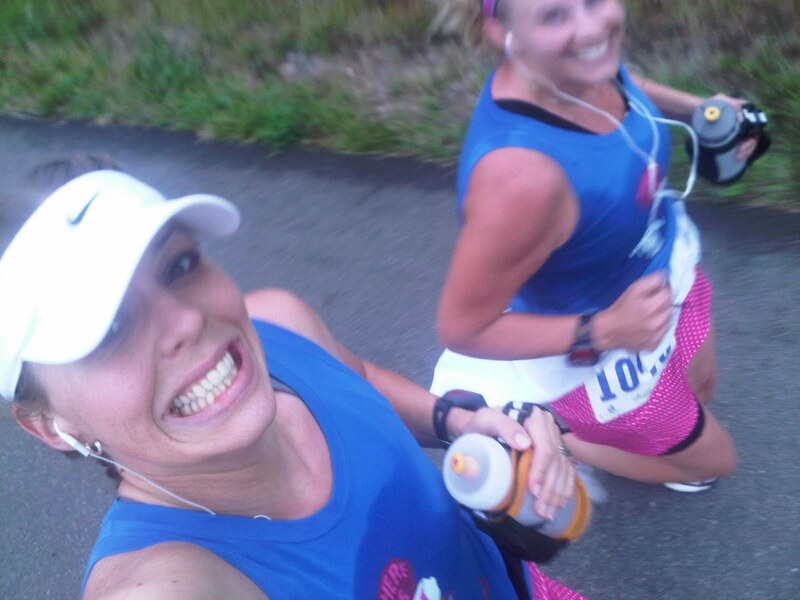 One day, you'll have to get rabbit ears and be a pace bunny at one of the marathons or half-marathons. Sweet!! You guys looks like you are having so much fun! 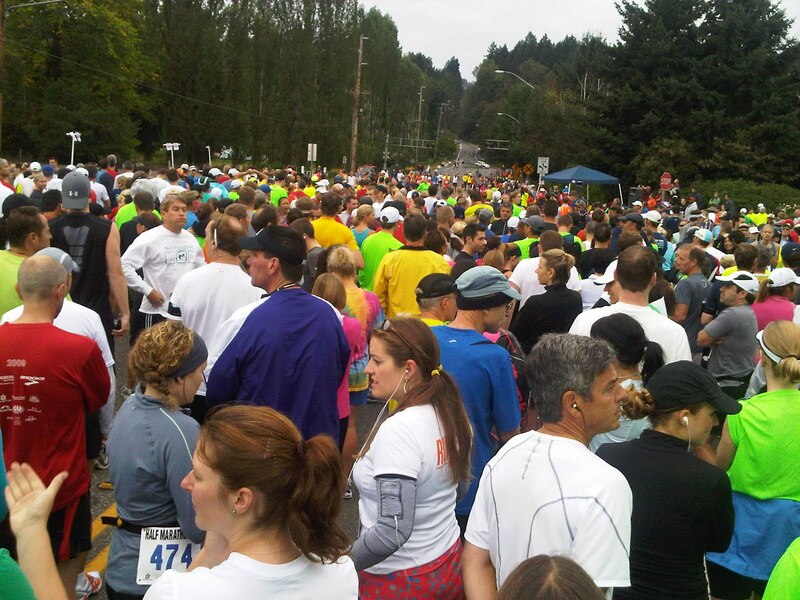 Great race recap! Sounds like so much fun!!!!! And I love the outfits!